Castle Vardulon: Bones, you're terrible! I don't ordinarily watch the show Bones, largely because it's terrible. Every time I randomly catch an episode it manages to shock me by being excessively awful in some way - suggesting that the team has a database of every tool in the world that could conceivably cause an injury, not bothering to explain why the FBI is called in on any of these random murder cases, doing an episode about whatever was in the public eye a few months ago (Jersey Shore, Teen Pregnancy Pacts, Polygamy). All good reasons to never watch the show again - but the most egregious sin the show commits by far is the incredibly sloppy mystery-solving the show engages in. Take, for example, this past week's episode, which concerned some body parts that appeared in people's toilets due to a backed-up sewer system. The team quickly figures out that the pieces must have originated in a penitentiary further up the pipeline, and decide to look for the culprit there. They quickly encounter Pruitt Taylor Vince, who must be the killer based on his relative fame compared to the rest of the guest cast. Now let's take a look at the preposterousness that the show has to offer. First we're asked to believe that, based on examining a skeleton that had been dissolved, crushed, and then sent through a sewer system, they could determine someone was stabbed with a conical shiv. 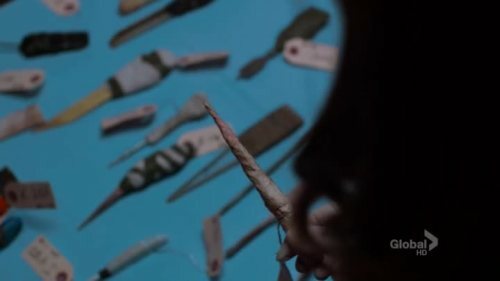 A completely unique weapon, made not from a sharpened toothbrush or piece of scrap metal, but rather a few rolled-up pieces of paper, which they find in a box of weapons discovered in the previous week's search for contraband. So, point number 1 - why would the killer have kept the shiv? After using it to murder someone your first logical step would be to get rid of the weapon, and this is a ridiculously simple weapon to get rid of. Literally dunking it in a glass of water would do the trick. The killer went to the trouble of dissolving a body, but couldn't be bothered to drop the paper knife into the acid as well? Hey, speaking of, where did the acid come from? Isn't this a prison? Well, it turns out that this prison's industry is largely concerned with producing mailboxes, and part of making them involves dunking the mailboxes in a giant vat of hydrochloric acid. This turns out to be a red herring, however, with the stains on the bones being inconsistent with hydrochloric acid. But what other acid could there possibly be in a prison? They get their answer by unfolding the paper knife, which winds up being from a cookbook, letting them know that the killer worked in the kitchen! But how did Pruitt dissolve the body and put it down the floor drain? The answer? Vinegar! Yes, according to the team it's simple enough to boil vinegar down, reducing it to acetic acid, which could have been used to break down the body. That's all the explanation we get. Does that make the least bit of sense, though? Consider this - in order to effectively and quickly dissolve a body with acid, you'd need enough to nearly submerge it, say about 200 litres. Which is a lot of acid - but far more vinegar. Since vinegar is maybe five percent acetic acid, you'd need twenty times as much, or 4 kiloliters of vinegar, to execute the plan. For Pruitt's plan to work he would need 4 tons of vinegar, enough alone time in the kitchen to reduce it to acid, a giant tub to store the acid in, and then the hours of unsupervised time it would take to kill a man, melt his body, and shove the remaining pieces down a kitchen drain, then finally clean up the ungodly mess all of that murdering and dissolving would have created. Is it possible that a killer could do all of this? Sure. Is it possible that he could do all of it in a prison? Dear lord, of course not. Where did you go to school? What's wrong with you that you would even think that? This entry made me chuckle. Bones is awful!! I only watch it like once a year, and somehow I've come to hate every damn character. I am thinking of starting a review for each episode of Bones. Kind of like the way you do for Criminal Minds. Any suggestions for me? I don't want to copy your format, but I still want to rate the episode. That's a great idea! I've only seen a few episodes of bones outside the first season, but I'm sure it deserves that kind of in-depth mockery. As for what to build your scale around, I'd have to study the show a little more to get a good idea of what terrible things show up every week. Nonsense science? Preposterousness of the FBI working the case at all? Obviousness of the killer? Anyhow, be sure to inform me when you start reviewing episodes, I'd love to read them! Dear the makers of "Machete Joe"